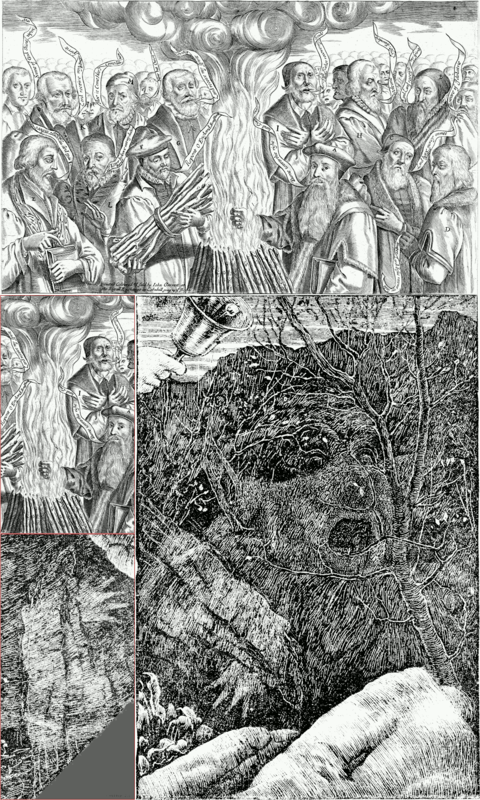 The center left image is a detail from an anti catholic propaganda print Faiths Victorie in Romes Crueltie (top; published by Thomas Jenner, c. 1630), which shows the burning by his foes at the stake. 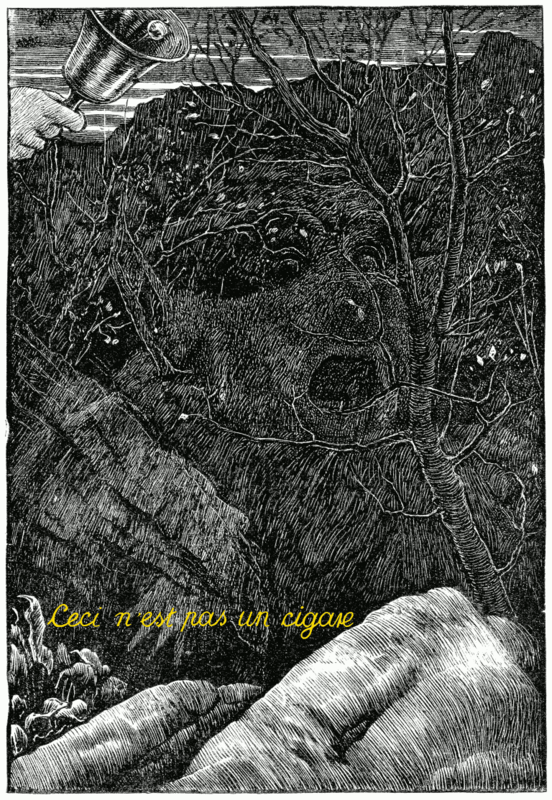 The bottom left image is a +135° rotated detail from Henry Holiday’s illustration (right side) to the final chapter The Vanishing in Lewis Carroll’s The Hunting of the Snark (published in the year 1876). This is one of the reasons why I believe that the “vanishing” of the hero in Lewis Carroll’s and Henry Holiday’s The Hunting of the Snark is an allusion to the burning of Thomas Cranmer. Im Dezember 2008 begann meine Snarkjagd. Be patient. This video is without sound. It doesn’t need any. [start]: A horizontally compressed copy of “The Image Breakers” (1566-1568) aka “Allegory of Iconoclasm”, an etching by Marcus Gheeraerts the Elder (British Museum, Dept. 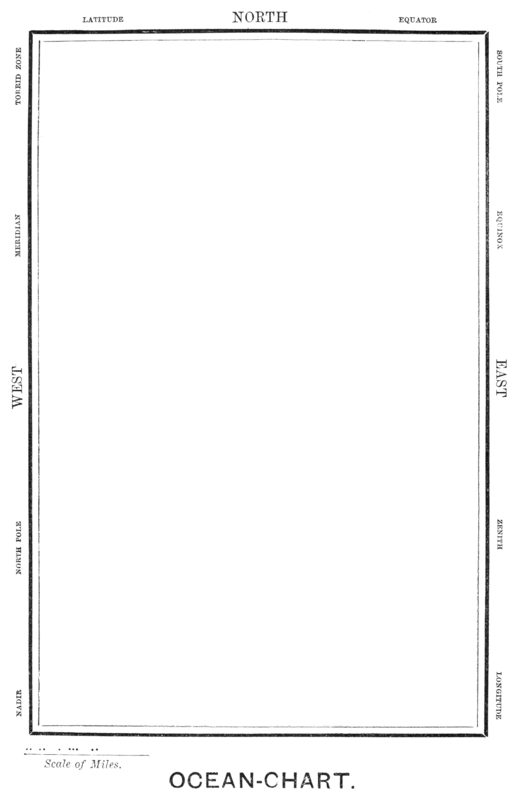 of Print and Drawings, 1933.1.1..3, see also Edward Hodnett: “Marcus Gheeraerts the Elder”, Utrecht 1971, pp. 25-29). I mirrored the “nose” about a horizontal axis. Ohne die gelben Buchstaben ist das die Illustration Henry Holidays zum letzten Kapitel von Lewis Carrolls Ballade The Hunting of the Snark (1876). Hier spielt Holiday mit der Wahrnehmung der Betrachters der Illustration. Die haben die Wahl, was sie sehen wollen oder nicht sehen wollen. Dabei sind sie aber selbst verantwortlich für ihre Entscheidungen. Darüber beschweren können sie sich bei Holiday aber nicht mehr. 090 Such a carriage, such ease and such grace! 092 The moment one looked in his face! 096 A map they could all understand. 100 “They are merely conventional signs! 124 Which consisted of chasms and crags. 152 With a flavour of Will-o’-the-wisp. 157 “The third is its slowness in taking a jest. 168 And those that have whiskers, and scratch.